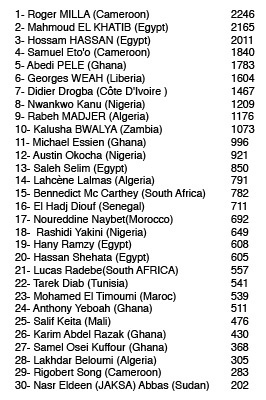 Last year in October, CAF asked its website users to nominate the 50 most-outstanding players who have played a significant role in the development of football in Africa between 1957 and 2006. According to the results released on Sunday 14th January, Cameroon soccer legend Roger Milla deservedly received the highest number of votes (2246 votes) from the 200 nominees. Therefore, he becomes the best player to have emerged in the continent during the last half century. Two Egyptians, Mahmoud al-Khatib and Hossam Hassan finished in second and third place respectively, with 2165 and 2011 votes. The current African Player of the Year, Samuel Eto’o of Cameroon, the only player to have won the award three times consecutively (2004, 2005 and 2006), came fourth with 1840 votes. Eto’o was closely followed by the former Ghanaian legend, Abedi Pelé. Although CAF, at the time of launching the poll, made an initial pre-selection of 200 players, they, nevertheless, allowed their site users to vote for any player, even if they were not mentioned on their list. The initial selection was done on the basis of national, regional, continental, FIFA Olympic competition and, of course, the World Cup. CAF had initially planned to release the long-awaited results in descending order (from 30th to first) by one player a day. However, they were inundated with immense pressure from anxious Internet users to publish the results in its entirety, two weeks before the scheduled date of February 8th. Roger Milla is often credited as the inspiration behind modern African football and was undoubtedly a major actor behind Cameroon's football success story. Milla played three World Cups, notably 1982, 1990 and 1994, and he reached his peak at 38 during the 1990 FIFA World Cup in Italy, carrying his country to a colourful quarter finals. He was in magic form throughout the competition, showing exceptional quick dribbling and great vision, thus winning him a place in the hearts of football fans the world over. It has been said that Milla is the best substitute player in the history of the World Cup. In fact, coming on as a substitute, he scored four goals at the 1990 tournament and set-up the two other Cameroon goals against England in the Quarter Finals. Interestingly, prior to the 1990 tournament, Milla had retired. But on the eve of the competition, he received a phone call from the president of Cameroon who pleaded with him to come out of retirement and put on the national jersey. He accepted the plea. Milla has also gone down in history as the player who introduced dance culture to World Cup football. After he celebrated each of his four goals by performing the famous Cameroon Makosaa dance at the corner post, celebrating goals has become standard for Milla is the only African on FIFA's list of classic players. The Cameroon-England match that Milla dominated was also named as a FIFA classic match. He has been voted twice as the "Best African Player of the Year" and he was also named in the chart of 100 World’s Best Players Ever, compiled by Pele of Brazil. He was chosen along with George Weah of Liberia as the best African players of the century. And at the age of 42, Milla played in the U.S. World Cup. During that tournament, as a substitute, he scored a symbolic goal against Russia, thus breaking his own record as the oldest player to score in a World Cup tournament. After the 1994 World Cup, Milla went into music, releasing one album with his wife, but it was never a hit. He is presently a roving ambassador for Cameroon and UNAIDS. CAF was created on February 8th 1957 in Khartoum, Sudan, with Sudan, South Africa, Egypt and Ethiopia as founding members. Today the body has grown to incorporate all the 53 countries in the continent making it one of the most competitive football organizations in the world.